Pest is as flat as a palacsinta (pancake), spread over a number of districts, taking in two-thirds of the city. 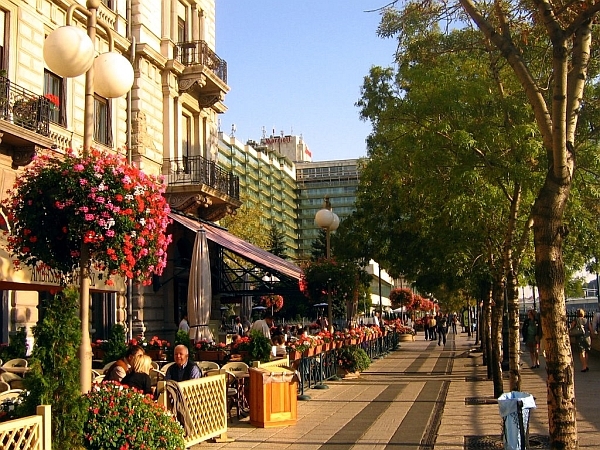 Pest is the heartbeat with the commercial and administrative center of the capital and of all of Hungary. Central Pest, the term used in this guide, is that part of the city between the Danube and the semicircular Outer Ring Boulevard (Nagykörút), where stretches of it are named after former Austro-Hungarian monarchs: Ferenc körút, József körút, Erzsébet körút, Teréz körút, and Szent István körút, changing names as the district changes. The Outer Ring begins at the Pest side of the Petőfi Bridge in the south and wraps itself around the center, ending at the Margit Bridge in the north. Several of Pests busiest squares are found along the Outer Ring, and Pest’s major east-west avenues bisect the ring at these squares. Central Pest is further defined by the Inner Ring (Kiskörút), which lies within the Outer Ring. It starts at Szabadság hid (Freedom Bridge) in the south and is alternately named Vámház körút, Múzeum körút, Károly körút, Bajcsy-Zsilinszky út, and József Attila utca, depending on the district, before ending at the Chain Bridge. 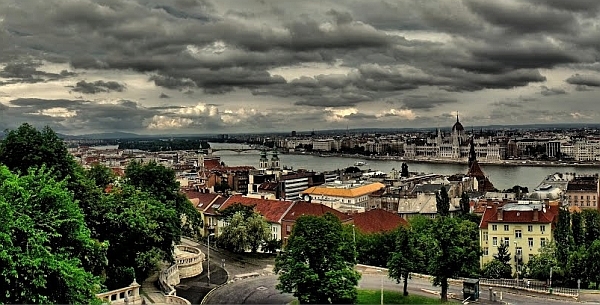 Inside this ring is the Belváros, the actual city center and the historic Inner City of Pest. For the traveler, the Pest side is our recommended side for accommodations since this is where the lion’s share of the action is and it is easy to walk to where you want to go. 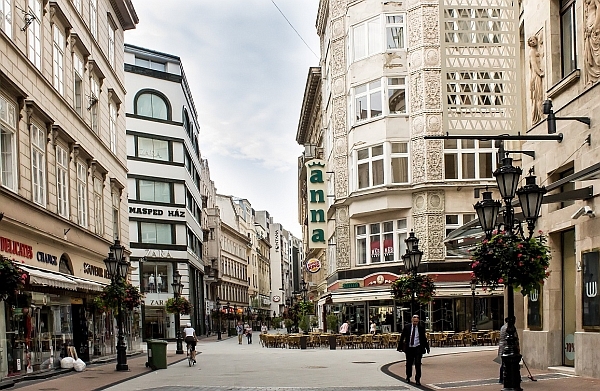 Váci utca (distinct from Váci út) is a popular pedestrian-only, touristy, shopping street between the Inner Ring and the Danube. 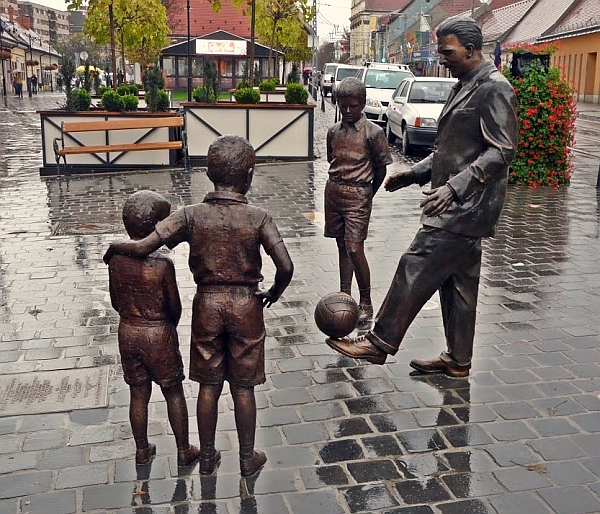 It spills into Vörösmarty tér, one of the area’s best-known squares. The Dunakorzó (Danube Promenade), a popular evening strolling spot, runs along the river in Pest between the Chain Bridge and the Erzsébet Bridge. The historic Jewish district of Pest is in the Erzsébetváros (Elizabeth Town), between the two ring boulevards. Margaret Island (Margit-sziget) is in the middle of the Danube. Accessible via the Margaret Bridge or the Árpád Bridge, its an enormously popular recreation park with restricted vehicular traffic. 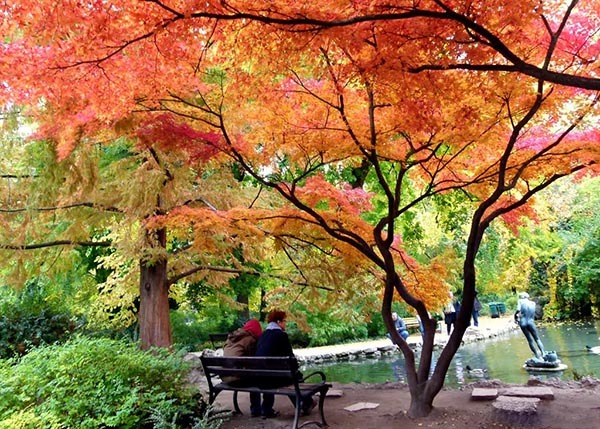 It is extremely popular in the summer for sunbathing, sports, jogging, and bike riding. It has a small petting zoo for children and the remnants of an old monastery. 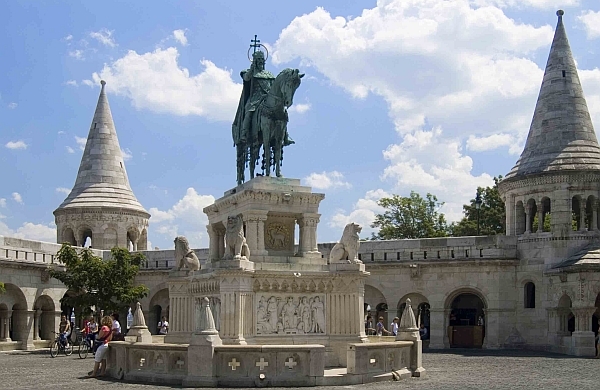 On the left bank of the Danube is Buda; to its north, beyond the city center, lies Óbuda. Buda is as hilly as Pest is flat and is a good place for hiking. 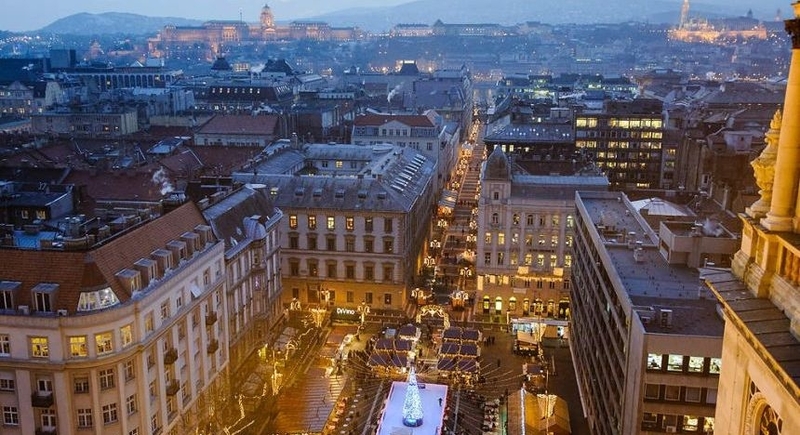 The two most advantageous vista points in the city are in central Buda on Castle Hill and the even higher Gellért Hill. Streets in Buda, particularly in the hills, are not as logically arranged as those in Pest. 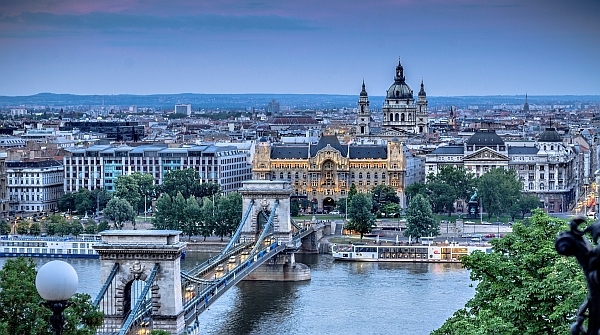 Castle Hill is one of the most beautiful parts of Budapest with its magnificent view of Pest. Castle Hill is accessed by steep steps, walking paths, and small roads that are not open to general traffic. There are three less aerobic ways to access Castle Hill for those who want to conserve their energy for other adventures. From Clark Ádám tér (at the head of the Chain Bridge) you can take the funicular; from Várfok utca (near Széll Kálmán tér) you can take the No. 10 bus; or from Deák, take the No. 16 bus, all of which will take you to the top. Castle Hill consists of the royal palace itself, home to several museums. The previous castle was destroyed in World War II, but was rebuilt afterward and named the Royal Palace specifically to house museums. 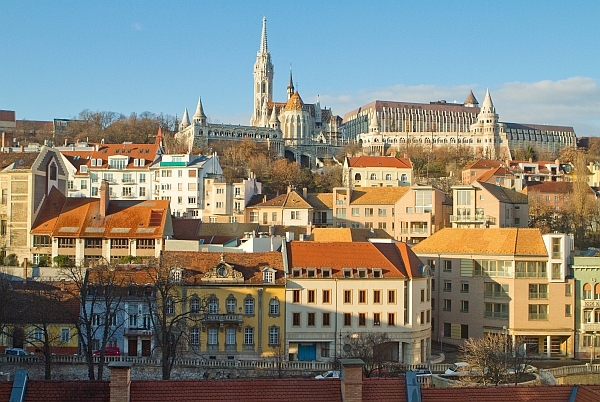 The Castle District has a long history going to pre-Celtic times, but what remains today are the medieval neighborhoods of small, winding streets, circling around Holy Trinity Square (Szentháromság tér), site of the Gothic Church of Our Lady or commonly referred to as St. Matthias Church. There’s little traffic on Castle Hill, and the only industry is tourism. Souvenirs, food, and drink tend to be more expensive here than in Pest. Gellért Hill, to the south of Castle Hill, is named after the martyred Italian bishop who aided King István I (Stephen I) in his conversion of the Hungarian nation to Christianity in the 10th and 11th centuries. 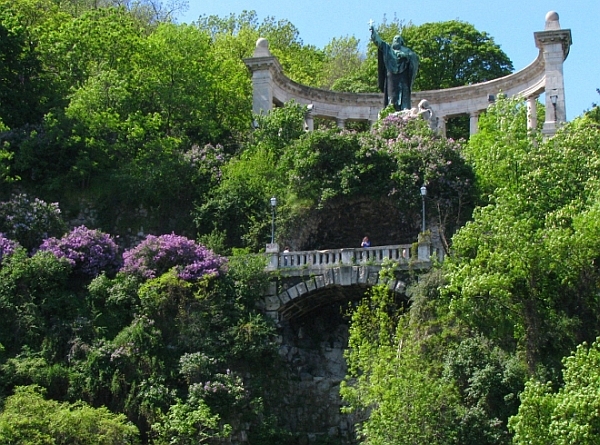 A giant statue of Gellért sits on the side of the hill, where legend has it that he was martyred by angry pagans for his efforts. On top of the hill is the Citadella, marked by a 14m (45ft) Liberation Statue of a woman holding a palm leaf to represent victory. It was erected in 1947 and visible from most points along the Danube on the Pest side. Below Castle Hill, along the Danube, is a long, narrow neighborhood and district known as Watertown (Víziváros). The main street of Watertown is Fő utca (Main St.). One of the original market places is off of Batthyány tér in this district. The famous Király thermal bath from Turkish times is right down the street. Central Buda, the term used in this guide, is a collection of mostly low-lying neighborhoods below Castle Hill. The main square of Central Buda is Széll Kálmán tér, just north of Castle Hill, a hub for trams, buses, and the Red line metro, this area is in serious need of revitalizing. Beyond Central Buda, mainly to the east, are the Buda Hills. Óbuda is on the left bank of the Danube, north of Buda. Although the greater part of Óbuda is lacking any architectural significance, reminding one of the Communist times, the area boasts both a beautiful old city center and the impressive Roman ruins of Aquincum. Unfortunately, the road coming off the Árpád Bridge slices the old city center in half, destroying its integrity. The historic center of the old city is Fő tér (Main Sq.) » a charming square dotted with small, yet impressive museums. Óbuda Island (Óbudaisziget) is home to an enormous park that swells in size every August when it hosts Hungary’s own annual Woodstock music festival, called the Sziget (Island) Festival. This festival has developed an international following.